It's important to consider what would replace a 7-Eleven on 11th and Avenue A. Since there are three liquor licenses within 500 feet of the site, it would be difficult for a bar owner to get passed the State Liquor License's constraints on license density. The next likely candidate would be a restaurant, judging by the local commerce in the EV. So how would a restaurant affect labor? 7-Eleven store associate hourly wage can be as low as $7.25/hr; $8.44 average (from Payscale and Glassdoor). 7-Eleven store associates are required to have English fluency: "Must be able to communicate clearly and effectively with customers and coworkers." They are also subjected to background checks -- no undocumented immigrants allowed. Mean average for a cook's wage, nation-wide, $11.20/hr; median: $10.29/hr; lowest 10%: $8.14/hr (BLS). No language requirement, no background check. So replacing a 7-Eleven with a restaurant in NYC would improve the wage prospects generally, and specifically of immigrant workers, documented as well as undocumented. Unless it were a chain restaurant -- a McDonalds cook wage averages, according to Glassdoor, $7.41/hr. That's one reason among many, NO 7-Eleven is trying to curtail all giant chains and franchises. Minimum wage may be fine for a 16-year-old's first summer job, but not a way forward for labor in general. "The majority (66 percent) of low-wage workers are not employed by small businesses, but rather by large corporations." Is it easier to organize labor in a giant corporation? Maybe (but maybe not). Giant corps also have greater political clout the larger they are, so there is a danger of promoting corporatocracy. In one way it's the meeting of Stalinism and libertarianism -- "free" market corporatocracy replaces the totalitarian state, the "internal contradiction" of libertarianism, trading one form of control (government) for another (corporate giants). Reminds me of a Maoist friend who voted for Giuliani thinking that his reactionary policies would spark a revolution. Instead we have rampant gentrification. NO 7-Eleven, a grassroots movement resisting the spread of chains and franchises, is holding a neighborhood-wide meeting this Wednesday. Their goal is to require that all corporate clone stores, including banks, be required to obtain approval before opening a new location so the community can have a say in the number and location of corporate chains and franchises. Details below. Please spread the word. New blog "Chinatown for Chinatown: a discussion board"
I started a blog about Chinatown planning called "Chinatown for Chinatown"
I've avoided blogging about Chinatown while I was involved with a Chinatown planning group. It's not the kiss-and-tell aspect -- I believe in transparency. But journalism gives the writer an unfair advantage within the group. It can bias the process or coerce it. But the Chinatown Working Group has mostly concluded its discussions, now waiting for its planning consultant to come up with recommendations to the group. So I can write as an outside observer. I've asked several local voices and urban planners to post as regular guest bloggers. I'm hoping to see an open, broad discussion that will be of help to the planning consultants as they dig into the issues and challenges that Chinatown faces. The complaints about NYCHA's infill losing park and air space are difficult for me to identify with. I grew up in Manhattan in a high-density urban street environment, like most Manhattanites. As a child I enjoyed that streetscape at least as much as the local public park. We played handball and boxball on the sidewalk, running around in alleyways, climbing fences. Still today I prefer to walk uptown on 1st Avenue, dull as it is, rather than walk through Stuy Town, which feels like a pristine, landscaped, anti-urban gated community. To me, the tenement street wall is attractive, comforting, neighborly and conducive to community, just as I far prefer tenements to the anonymity of elevator building compexes or the isolation of single family houses. So I was gratified to hear GOLES director Damaris Reyes' response last night to NYCHA's presentation to Community Board 3. She jumped on the real danger of the infill scheme: the dilution of the political base in the projects and its likely consequence, the erosion of political will to maintain the NYCHA tenants. Amidst all the NIMBY concerns -- one white gentleman with the most beautiful brown shoes I've ever seen, worried that the new rich tenants might crowd his child out of the better local public schools, a worry that drove home to me, no prejudice to him or his honest issue, just how far this community has changed -- Reyes was almost alone in speaking to the social issue of preserving the community. Bernard Marti also faced that issue, but he spoke in favor of the infill plan, expressing his hope that it would help the NYCHA properties so desperately in need of help. Everyone else demanded a better community process, which seems to me a diversion. We already know what the problem is -- the state has no commitment to public housing. How is a "community process" going to change that? You might object that, even without the infill, this neighborhood is developing and gentrifying anyway -- it's just a matter of time, and this infill will at worst speed it up by a few years. That's too coarse-grained an analysis. The poltical base here has remained in the older residential demographic despite demographic upscaling partly because the local housing stock of tenements is ill suited to permanent or family housing, and ideal for transient students and young singles. So the PS 64 transformation into a dorm will bring a lot of youth commerce (bars), but will not change the political base -- most students don't vote. The infill market-rate housing will bring permanent resident voters. I asked the NYCHA presenters privately why the state won't build the market-rate housing and give the profits to NYCHA rather than let a private developer build and own it and reap the profit. They explained that the state simply won't touch public housing. This is plain deceit on the part of the state: it builds prisons, and there's no question that prisons are, among other things, public housing, except it doesn't generate market-rate rental revenue. Our political office holders, assuming that there's no alternative to the NYCHA leasing scheme, are left complaining about the lack of "community process" on how to implement the infill leasing plan. But there is an alternative. Here's an op ed I wrote for Bowery Boogie explaining what the city and state can and should do. That they haven't done this suggests to me that the state has no faith in the future of public housing. That's scary. There’s been a furor over NYCHA’s plan to lease so-called underused properties to private developers, but there have been few alternative solutions offered. While everyone complains, the NYCHA tenants continue to suffer from hurricane damage and inadequate management. So complaints without solutions just won’t cut it. Everyone on all sides agree that if the city would properly fund NYCHA, there’d be no need for this leasing scheme. And many are ready to fight to get that funding today. That’s heartening. But it’s not the solution. Getting the funds today might be possible in this election year amidst the noise that the leasing scheme has raised, but what about next year, when it’s not a city election cycle year and the locals have forgotten all about NYCHA? Fighting for the funding means NYCHA tenants get services one year in every four. In between, they’ll be literally left in the cold. NYCHA needs a steady, dedicated revenue stream protected from changing political winds, revenue that won’t be syphoned away from NYCHA and its tenants. And it needs a transparent process that will guarantee that the funds won’t disappear into someone’s personal pockets. The current leasing scheme fails to meet that need from the start. The profit derived from the new market-rate units will go straight into private pockets by right, without even any political corruption or subterfuge. NYCHA is giving its own potential revenue away. Handing the people’s public property into private hands for their personal profit is the opposite of good government. It’s a travesty. Why doesn’t NYCHA ask the state to intervene, construct the market-rate units itself, and give them to NYCHA? The state loves to construct — prisons, schools, more prisons. It’s easy for the state: issue a bond, the funds go to the huge construction industry, a state favorite, with lots of jobs. And market-rate housing yields a fast return, so why not? Years ago, when I sat on the CUNY Board of Trustees, I watched the state cut the tax-levy budget to shreds, but I never once saw the state deny a capital construction item. That the city hasn’t asked and the state hasn’t offered suggests to me that neither really wants to save NYCHA housing at all. A 99-year lease will not generate enough for NYCHA’s needs in the future. Luxury housing might, if it were owned by NYCHA, not a private developer. Should the state get into the business of luxury housing? Consider why government is viewed as a shabby landlord. Government is capable of managing quite well — look at libraries, rec centers and parks, all widely used. But when it comes to housing, government owns only low-income housing. It’s a kind of self-fulfilling prophesy. If the state owned the Upper East Side, it would be rolling in dough and well able to maintain those properties with plenty to spare to keep up its low-income properties in style. But it doesn’t own upscale properties with surplus revenue and, let’s be honest, the city just doesn’t care about its low-income residents. Certainly that’s been true under the current city administration, its mayor and city council leadership. Let the current tenant community set out ground rules for public use — music, noise-making (upscale partiers make a lot of noise), barbeques and such — to minimize conflicts between the new and the old. How to ensure a transparent process that will prevent corrupt officials from stealing NYCHA funds is tough one. It’s a challenge that has to be met no matter what NYCHA chooses to do. Smith doesn't assume an upper limit on luxury demand, he thinks the upper limit is reached when overdevelopment begins to lose its attraction. It's a scary thought: the rich lose interest in bland elevator buildings, so they raid the neighborhoods without them. Their presence attract their elevator-addicted friends, so developers construct for them and transform the neighborhood, driving the upscale to seek a hipper slum to raid. It's already happened here -- the Schwimmer Manse. Matt Yglesias has been arguing to remove zoning restrictions that prevent residential development and increase rents. It's the obvious answer to the misguided view that rent regulations raise market-rate rents. Adding supply lowers demand and price, but evicting regulated renters don't add supply since the evicted tenants remain in the renting pool (the piece I did for Met Council's Tenant/Inquilino explains this in more detail), so they just raise rents wherever they go in the locality. The only available means of adding supply, short of killing renters, is construction. As it happens, rent regulations are one of the very few incentives to construct housing: new housing, unless it's subsidized, is unregulated. Yglesias also points out correctly that if cities don't construct, a tight housing market gentrifies their older, lower-income neighborhoods, displacing whole communities. But what happens when the city constructs at a scale commensurate with its demand? Yglesias seems to assume there is a limit to demand. That might appear to be necessarily true, since there's a limit to global population. But one person can rent more than one unit, so any limit has to be found in the aggregate funds available for rents, and there's no reason to assume that that's necessarily limited, especially where there's fiat money, and that holds of just about every nation across the globe, even Europe if considered as a whole. 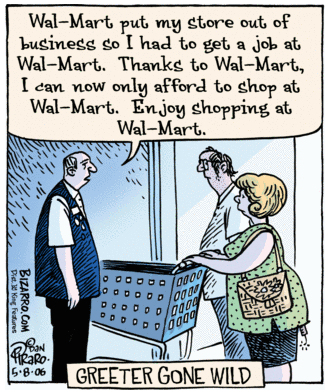 In most urban markets, the limit is reached through preference and employment opportunity. More people want to live in L.A. than in Detroit, and in particular, more people with more money want to live there, for a variety of reasons. Supply that preference demand, rents should decline, or should they? But not all markets have a limit. Some actually create more demand the more it is supplied. Bars are a perfect example. One or two local bars may suffice for a neighborhood. But if the neighborhood boasts many lively bars, it becomes a nightlife strip attracting non locals. The more the bars, the more attractive the strip to non local consumers. More supply=more demand. Some cities have this attraction too. The more you construct, the more people live in the city, the more people want to be where those people are. People are themselves an attraction, especially among young singles actively seeking. So if New York abandoned its zoning regulations and constructed wildly, would market rents decline? Would the upscale leave older neighborhoods to themselves? Or would New York just grow, continuing to spread upscale development everywhere? If that's so, then the Yglesias recommendation won't help New York, unless other cities become more attractive and cheaper than NYC. The only hope I see to prevent gentrification of the entirety of this city, is recommending the Yglesias solution to other cities. The Art Canard: artists bring gentrification, not! Time to put to rest the tired complaint that artists gentrify neighborhoods. In the 1950's and '60's, lots of artists moved into the Bowery. Many began to move out in the '70's and '80's, and most were gone by the 1990's. From the 1950's to the 1990's the Bowery steadily declined. Even the so-called Bowery renaissance (CBGB's, Amato Opera and the Bowery Lane Theater were active, but all around Bowery & Bond) had no gentrifying effect on the Bowery overall. When gentrification began when the Chystie Avalon opened in 2005, most of the artists had long been gone. In other words, there was no relation between the presence of artists and gentrification. Those are just the facts. Also in the 1950's artists moved into the LES north of Houston, what's now called the East Village. Did the neighborhood gentrify? No, it declined. It declined for four decades. When did the neighborhood gentrify? When the entire city began to revive in the late '80's and especially through the Clinton boom. Does it take forty years before artists gentrify a neighborhood? The presence of artists preceded gentrification in Williamsburg by about a decade. But notice that gentrification in Williamsburg began around the same time as the gentrification of the EV. And it sped up radically after it was rezoned under Bloomberg. It empirical facts show unambiguously that artists have no effect on gentrification whatsoever. Gentrification responds to upswings in the economy and administrative efforts to capitalize on it. The renovation of Tompkins Square Park -- an administrative decision -- began the gentrification of the EV in earnest. The construction of the Chrystie Avalon, another administrative effort, ironically intended to bring affordable housing, gave gentrification its first entree into the Bowery, which had until then been considered an unredeemable skid row. The role of capital accounts for the driving pressure of gentrification. Administrative decisions are the facilitator. It is a mistake to suppose that gentrification is inevitable. If the administration promoted development vigorously away from low-income neighborhoods, those neighborhoods might have a chance. Instead, DCP plans exactly the opposite. It seeks to spread gentrification through zoning throughout the city. Gentrification raises revenue, human beings be damned. We're going to chalk up the park at the Tompkins Square Park nonbandshell at 2pm and then take our chalk and our Community Wheel of Fortune to the corner of Avenue A and 11th Street, the site of the threatened 7-Eleven, and chalk up the street and talk to the passers-by who don't yet know what's coming to their neighborhood. Join us for some good old anti-corporate-anti-suburbanization-and-anti-Pringle-ization-of-our-souls-and-our-streets fun! Daddy, where does community come from? A brief history of how NO 7-Eleven got started. "Did you see that 7-Eleven is going to open on the corner of Avenue A? Is there anything the block association can do?" "Well, I don't know, but we can have a meeting and see." After a few emails, the 11th Street ABC Block Association sets up a meeting for November 14. And then came hurricane Sandy. Basement apartments on our street were destroyed. Boilers busted. Circuitry ruined. No lights, no heat, no phone. But we still had a scheduled meeting to hold, so we added hurricane relief to the agenda. Big meeting; biggest meeting we'd seen of our Block Association ever. Who was there? All residents, some young, some old, some new to the street, but mostly old-timers from the '70's, artists, performers, poets and some ordinary working folks, even people who grew up on the street. Starting with introductions, we asked everyone what they wanted to discuss. No one wanted to talk Sandy. Everyone was there to oppose the 7-Eleven. That's how NO 7-Eleven began. The Community Wheel of Fortune w/prizes! Two new plays especially written for this very special event!